The ultimate rogue's gallery, Scarecrow, Joker, and Bane! The foes on this Batman Dark Knight Trilogy Morphing Mug have challenged Batman mentally, ethically, and physically. At every corner the Dark Knight has bested them, proving that even the worse villains are no match for him. The Dark Knight Trilogy has been met with acclaim by both the critics and the fans. 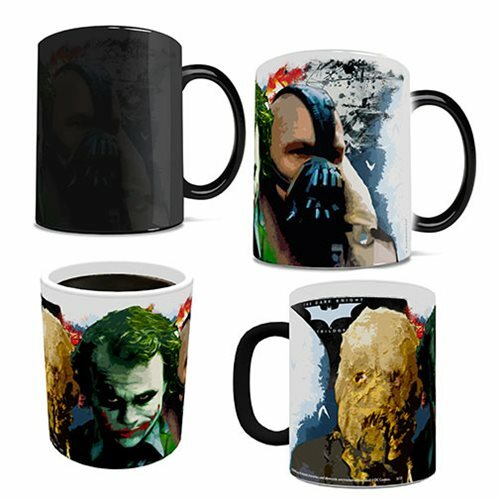 Now you can own a piece of movie history with this Dark Knight Trilogy heat transforming mug. Simply pour in hot liquid and become the Dark Knight as you stare down the faces that oppress the city of Gotham. This 11-ounce Morphing Mug transforms from black as hot liquid is added! Watch as the heat-activated process reveals the hidden image in full vivid colors! Hand wash only. Not dishwasher safe. Ages 14 and up.